My recent trip to Brunei has been a really fulfilling one whereby I not only get to had a greater depth of its traditions and culture but also learning about how Brunei keeps its country going greener each day despite the challenges faced ahead. Let me start of with sharing some of their green and environmental-friendly initiatives which have been on-going in this emerald state of Borneo. It’s hard for me as a Singaporean to not compare how different Brunei is from our country in terms of the efforts made to protect the earth. Since 2011, Bruneians have been carrying their recyclable bags along with them to the shops on weekends. This is just one of the initiative by the government to encourage a plastic-free lifestyle among its people. It’s a daunting task to eliminate the use of plastic bags which we so conveniently rely on to contain our grocery items and rubbish and dispose them when they are soiled. The implementation of this green initiative is just one of the small steps taken by the government to help save the Earth. In comparison to Singapore, the ‘Bring Your Own Bag’ day,where Singaporeans are encouraged to use recyclable bags instead of plastic bags on Wednesdays, was a failed attempt by our government to promote the 3R’s. Why? Because the supermarkets and participating stores were still offering plastic bags to customers for 10 cents each. Why bother to bring a reusable bag when all one needed to do is to fork out an additional 10 cents for a plastic bag out of convenience? Some organizations took a step further by extending the initiative to Fridays as well. 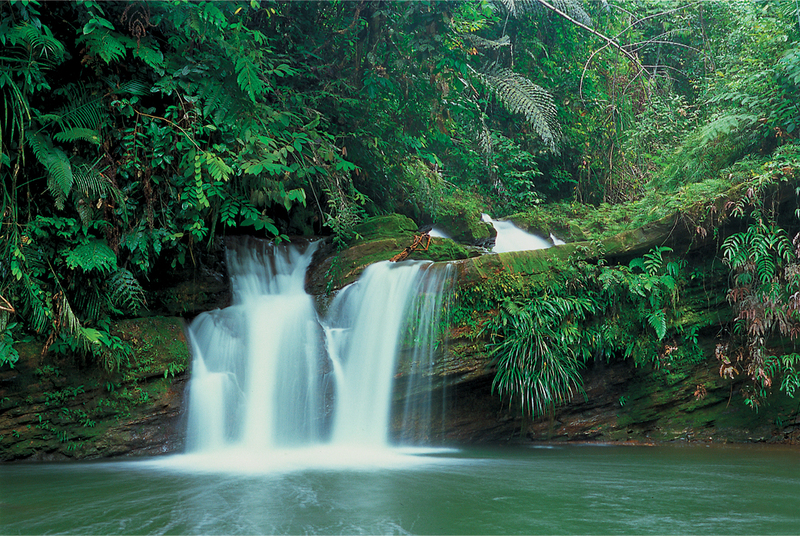 With more than 70 percent of the country under tropical rainforest cover, Brunei attracts many nature lovers who enjoys doing for green adventures such as juggle trekking and canopy treetop walks in the heart of the pristine and undisturbed primary rainforests. Brunei’s prized green space is considered as one of the most diverse ecosystems in the world with it’s wide range of habitats from lowland forests to mountain forests. Though being pressured by the urbanization going on around its neighbouring countries, Brunei still managed to preserve it’s tropical rainforest and step supportive measures to keep the primary forests in its pristine condition. Once again, the Bruneians could pride themselves as a pollution-free state mainly because of its use of natural gas as a source of fuel. According to U.S Energy Information Administration, Brunei relies on natural gas to power nearly all of its electricity generation since natural gas is the cleanest fuel among the other fossil fuels.Initially, I had a preconceived thought that since Brunei is a substantial producer and exporter of crude oil, she would have rely on oil as a main source of fuel. But from a conversation with our guide, Anthony, I came to realize of how shallow my knowledge is when it comes to about the oil and energy industry. Though, I probably don’t need to know much about this industry since I’m not generating bucks in it but I want to learn more about this industry as well as energy because it is concerning the earth and the lives of our future generations. If you view the earth as our home and the people residing on earth as one big family, then you might not where I am coming from. The notion of ‘our home’ being in the face of danger of being wiped out and destroyed has really got me thinking about the future state of the earth. But I do felt comforted and assured to know that countries like Brunei are heading in the right direction to provide an environment-friendly living space for its people. Countries like Singapore are also now gradually looking into the use of cleaner fuels like natural gas and also other alternatives of fuel to produce electricity. Currently, in Singapore, 70% of its electricity is generated from natural gas. However, natural gas, like other fossil fuels, do also face the problem of depletion. Though some experts have speculated that our world’s current oil and gas reserves could last us for another 60 to 90 years, that does not necessarily mean that we are entitled to use it til it runs out. Or til the last light bulb on earth extinguishes in the dark? In fact, both alternative energy companies and government bodies could make use of this time span to research into ways to generate electricity cleanly. Electricity should also be made affordable so that energy is readily made available to everyone, even to the poor dwelling in under-developed nations. Only then, resource-poor countries like Singapore would not have to rely heavily on oil and gas imports to survive. Even oil-rich states such as Brunei would not have to fret about oil reserves going into depletion one day. The pressure and fight is on to keep the world safe and clean for everyone to live in. The trip to Brunei has really got me thinking about the possibility of putting a stop on the reliance of fossil fuels. Never stop dreaming, because who knows that one day, our earth could be powered entirely by crystals. Read more about NRGLab’s current projects on their SH-boxes which relies on polycrystal technology to generate electricity here.